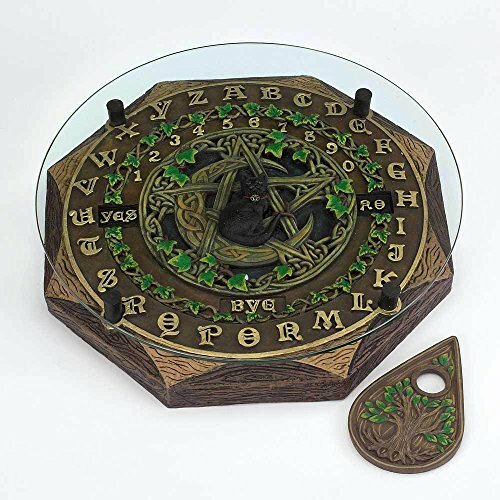 Fantasy Gifts Black Cat and Crescent Moon Ouija Board with Planchette and Glass Top Paranormal by Fantasy Gifts at UtopyaCon. MPN: 2034. Hurry! Limited time offer. Offer valid only while supplies last. . Black Cat Around A Moon And Pentagram Ouija Board. Glass top sits on four pegs raised off the board. Made from cold cast resin and glass. If you have any questions about this product by Fantasy Gifts, contact us by completing and submitting the form below. If you are looking for a specif part number, please include it with your message.